-When tributary temperatures drop into the mid to low 30's steelheader's need not hit their favorite steelhead hole at the crack of dawn. Better to sleep in and try from late morning to early afternoon when water temperatures have nudged up enough to activate lethargic steelhead into biting (morning surface slush flows are usually also melted by then). Don't worry about the crowds; solitude is the norm in winter steelheading. -Dead-drifting flies like egg patterns and bead-head nymphs as well as small wooly buggers and streamers are deadly in the ice water tributary flows of winter as long as you keep them near the stream bottom (where winter steelhead hold), drifting at or slightly slower than the bottom water current. Incorporating brass, tungsten or glass beads as well as wire ribbing and heavier shanked hooks into these patterns ensures that they stay near the bottom and allows for less shot usage. -Winter steelhead can be very finicky and fussy and prefer smaller, dead-drifted flies drifted literally into their face. They will rarely move more than a couple of inches for a fly on a dead-drift. With this said, it is extremely important to perform multiple drift presentations and cover the drift completely, whether a run, pool tail-out or back-eddy. The difference of a few inches in your presentation can result in a hook-up that you would have otherwise missed. -Successful winter steelheading means patience. Multiple presentations covering the entire drift, precise indicator depth adjustment, tippet (length/size) and shot adjustments, fly changes (size/color) are all part of the game to get that perfect drift to steelhead that at times seem to have a severe case of lock-jaw! -Dress properly for the frigid conditions (knit cap, wool fingerless gloves and mitts, thermal underwear, fleece jacket, windbreaker, chemical hand warmers, neoprene style/boot foot waders) and periodically walk between holes and runs to keep feet and hands warm for the fishing action. -During a severe winter cold snap, steelhead will forgo overhead cover and hold in slower pools and runs that have moderate depth (4 feet or less) and dark bottoms. These locations (you have to fish them before they freeze over or break the ice and come back later) energize and activate steelhead since sunlight penetration warms the stream bottom as well as the backs of the steelhead. During milder winter periods look for steelhead to hold in more deeper bend pools, pool tail-outs, pool back eddies and runs as well as faster/broken water areas which all provide good cover from predators and direct sunlight without “super-chilling” the steelhead. This buck winter steelhead could not resist a bead-head scrambled eggs! -Accidentally dunking your fly reel in the water is a “no-no” for the winter steelheader. The reel can quickly freeze-up and bind in sub-freezing air temperatures. Your windshield heater blower comes in handy to quickly thaw/dry frozen reels (although a complete drying will be required later to remove all the water in the reel). -Felt bottom wading boots can quickly build up with snow making hiking along your favorite tributary difficult. Companies like Korkers, Simms and Patagonia offer rubber soled wading boots that are ideal for hiking in the snow without snow buildup. The Korker and Simms models also come studded. 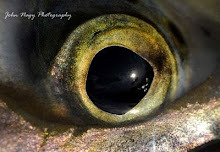 -The tip top on your fly rod is the first guide to freeze over in sub-freezing air temperatures making fly casting, performing techniques and playing fish difficult and at times impossible. Remedies for this include installing an over-size tip top and over-size snake guides on your custom made fly rod (the John Nagy “noodle” fly rod has these built-in/see photo above) and applying Vaseline lip balm or Stanley ice off paste to the tip top and snake guides periodically throughout the day to prevent/slow down freeze-up. -Fly fishing in the winter is tough on fly lines particularly when you cast them through iced over guides on your fly rod which can damage the exterior coating of the fly line. At some point this is going to happen no matter how diligent you are at keeping ice off the guides. A good strategy is to have a fly line strictly for sub-freezing conditions and keep your good lines for other times (fall and spring). -Swinging flies in frigid tributary winter flows (30 degree range) can be successful as long as you keep your fly on the bottom (use the fastest sinking leader or sink tip you have without dragging bottom on the swing) and slow down the swimming speed of your fly (by doing multiple upstream mends of your fly line on the swing). Also use fly patterns like zonkers, marabou speys, long winged streamers, wooly buggers and sculpins that incorporate materials like marabou, artic fox tail, rabbit strip fur, temple dog fur, schlappen feathers, etc. that have great movement in the current flow. 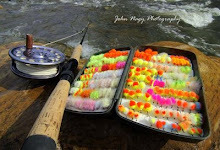 Adding beads, cones or using metal tube designs will help keep these flies on the bottom. Adding fluorescent color(s) or a little flash material to the pattern can entice strikes. Swing them through pool tail-outs, eddies and slower/deep runs (of course you will need open water areas!). Jigging the fly or using a strip retrieve at the end of the swing can also be effective. Again, a few degree temperature increase during the day (usually occurring from mid-day to early afternoon) can activate steelhead into taking a fly. -Run-off from winter snow-melt usually runs clear (typically a slow, steady melt) as long as night time air temperatures stay below the freezing mark. Rain and rising air temperatures though can quickly melt snow cover and result in high/stained tributary conditions. -A common strategy for winter steelheaders is to break the ice in a pool that is partially iced over (using their feet and/or downed tree branches), letting it rest for awhile and then coming back later to fish it. Surprisingly the steelhead settle down pretty quickly after all the commotion. Dead-drifted flies are particularly effective after this tactic. This is a relatively easy thing to do when the ice cover is thinner (and in pools that can be waded) but with really thick ice it is not advisabe unless your looking for a sprained or even broken ankle! 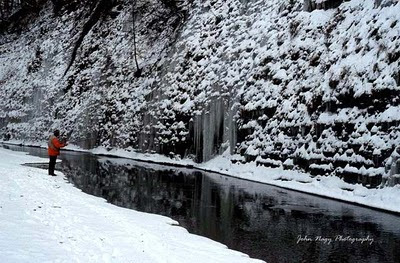 -It is hard to predict what kind of tributary conditions ice water steelheaders will encounter on the Lake Erie tributaries during the winter. During mild winters, they remain open (including the lake shore) with only nuisance slush and ice flows in the morning. During a more average climatic winter, expect periodic tributary freeze-overs with both a traditional "January" thaw and also a number of "mini-thaws" opening up the tributary flows to fishing. Note: Often the toughest part of winter steelhead fishing is actually getting to (and traveling back) from the Lake Erie tributaries. Local steelheaders definitely have an advantage here. Anyone considering steelhead fishing this time of the year (and traveling at a distance) should carefully monitor the weather for lake effect snow and ice conditions as they impact the interstates and state routes. No steelhead is worth being stranded on the highway or getting into an accident for. Look for "windows" in the weather for traveling to and from the tribs. If bad weather hits (after a day of winter steelheading) seriously consider spending the night at a local motel to avoid any problems. 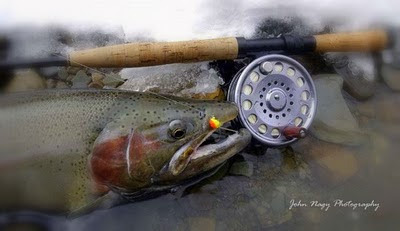 More detailed information on winter steelheading can be found in John Nagy's classic book "Steelhead Guide, Fly Fishing Techniques and Strategies for Lake Erie Steelhead". 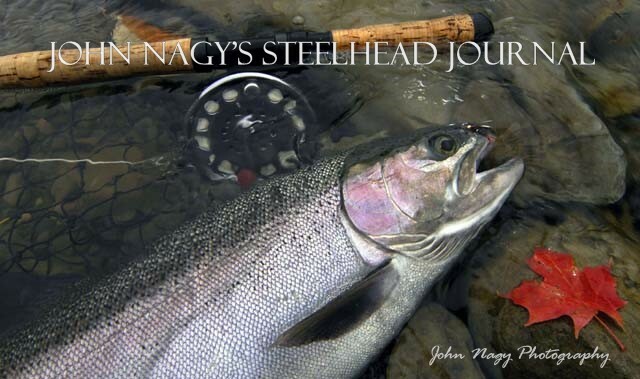 His new "Steelheader's Journal" makes a great companion book to the Steelhead Guide and is now available.